There are few personalities who evoke such universal feelings of warmth as Fred Rogers. An enduring presence in American homes for over 30 years, his plainspoken wisdom continues to guide and comfort many. 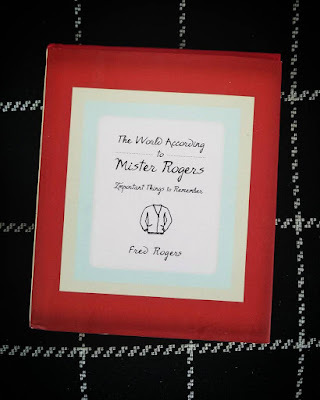 The World According to Mister Rogersdistills the legacy and singular worldview of this beloved American figure. I first saw this book a couple of years ago during a random Barnes and Noble trip with my husband and daughter. As soon as I spotted it laying on one of those round tables right next to the entrance, I knew I had to have it. I watched Mister Rogers' Neighborhood often growing up. I can't say that I was a huge fan of it back then (though I did enjoy it) but it was on constant rotation at my grandparents' house. I'm thankful that they made me watch it back then because it opened up a world of kindness, creativity, and love for me. Something I was in desperate need of at a young age. Though I had a rough upbringining, I like to think that I grew up to be a kind, intelligent adult that truly cares about other people and their circumstances. Sometimes too much as I find myself empathic and feeling too much of the emotions around me. As an adult I do have issues with things like anxiety and depression but it's because of things like this that Mister Rogers means so much to me. It's refreshing to have a show, and a person, that is truly beautiful and made a difference in every life that he touched. As a parent now, it makes me happy to know that I can introduce my children to such a true human being (and thankfully even more now with Daniel Tiger!) and show them a good example of kindness and how much it really means to people and their lives. One of my favorite takeaways from Mister Rogers, and this book, is: "I like you just the way you are". I even teared up while reading through some of these pages because it's just a powerful message to children, to anyone, that they are liked, loved, and accepted exactly for who they are. It's definitely a message I needed as a child and I love that his words continue to make a mark on the world.